One thing that stirs me from my slumber when it comes to my investment trust portfolio is when there is a change of manager. It doesn’t happen very often, and it typically doesn’t require evasive action, but it does mean that I tend to watch events a little more closely. JPMorgan Global Growth & Income, aka JPGI, is a fairly recent addition to my portfolio. In early March, it announced that its manager, Jeroen Huysinga, was leaving to pursue a new career in the charity sector. Their philosophy is that companies are ultimately valued on their projected future cash flows, so the analysts rank the universe of around 2,500 stocks into valuation quintiles. For JPGI, those in the two cheapest quintiles are subject to further indepth analysis. Companies considered for investment must have at least 25% profit growth potential from current to normalised earnings per share, and there must be an identified catalyst that could lead to a potential share price revaluation. The two cheapest quintiles, presumably around 1,000 companies, are then whittled down to 50-90 in the actual portfolio. A fair amount of judgement is applied by the fund’s manager, therefore, when choosing the actual portfolio. You might have noticed that this is a very old investment trust. I believe its the fifth oldest in the UK and it was set up less than a decade after the eldest, F&C Investment. For nearly a hundred years, it was known as United British Securities Trust. It became the Fleming Overseas Investment Trust in 1982 and then JPMorgan Fleming Overseas in 2002. The fund’s manager, Robert Fleming & Co., was taken over by Chase Manhattan in 2000 which then merged with JPMorgan a year later. The Fleming name was dropped completely in 2006. Finally, JPMorgan Overseas Trust became the tongue-twisting JPMorgan Global Growth & Income in 2016. I haven’t been able to ascertain exactly when JPGI started using JPMorgan’s global focus investment approach but I suspect it coincides with Huysinga’s appointment in 2008. Prior to that, the trust was managed by Ed Walker for about five years. JPGI is one of the investment trusts that has taken advantage of the rule that allows dividend payments from capital. It made the change in the summer of 2016, a couple of weeks after the EU referendum, declaring a new distribution policy set at 4% of its net asset value at the end of June each year. The move has been heralded as a masterstroke by many commentators and instrumental in narrowing the discount to net assets from over 15% at the time to a small premium today. Closer examination suggests the effect was probably a little less dramatic. JPGI traded at a 6-8% discount for several years after the financial crisis. The spike to 15% was fairly brief and probably caused by the collapse of the pound after the referendum result. This increased the sterling value of overseas investments and it probably took the JPGI share price a little while to catch up. A move to the global equity income sector and a name change were made at the same time, and all this probably helped raised the fund’s profile, and boosted demand for its shares. A good move, therefore, but perhaps not a great one. Dividends have increased substantially under the new policy. They were 3.2p prior to the change and are 12.52p for the current year. Of course, as dividends are set as a fixed percentage of net assets, they are unlikely to go up in a nice, smooth line. We won’t ever see this trust in the AIC’s list of dividend heroes. As a rule of thumb, markets tend to go up two years out of every three. That suggests there is a one in three chance that JPGI’s dividends could fall in any given year. Looking at stock market history, we know that 20% falls happen a few times every decade. It will interesting to see what happens should a fall of this size coincide with JPGI’s June dividend date. Will they cut the dividend by the full amount or decide to ease the pain? Of course, in the end, it should all come out in the wash. It shouldn’t matter whether gains are capital or income (although the tax treatment may differ if you hold outside of an ISA or SIPP). However, anyone looking at this fund solely for its high income needs to appreciate how volatile it might be from year to year. Huysinga has been with JPMorgan since 1997 and has managed JPMorgan Global Growth & Income since 2008. That’s a decent run, but many investment trust managers chalk up multiple decades at the helm. He is 55 this year, so I expected him to be in situ for several years at least. Tim Woodhouse has been helping Huysinga run the portfolio for the last eighteen months, so perhaps the ground was being prepared for a little while. Jeroen’s specific portfolio management responsibilities will be transitioned to other highly experienced members of the same Research Driven Process (‘RDP’) Portfolio Management team within JPMorgan. Rajesh (Raj) Tanna and Helge Skibeli will join Tim Woodhouse as the Company’s joint portfolio managers with effect from 14th March 2019. Raj Tanna has 22 years of experience in the investment management industry, including 18 years as a portfolio manager. He is Head of the Research Driven Process (RDP) International Equity Team at JPMorgan. Helge Skibeli has 33 years of experience in the industry, including 19 years as a portfolio manager. He is Global Head of Developed Market Equity Research and Global CIO of the Research Driven Process (RDP) and U.S. Equity Core business at JPMorgan. This sounds fairly reassuring. Nothing too abrupt and no radical change in the underlying process. Woodhouse looks pretty young to my ageing eyes, though, and has been at JPMorgan since graduating from the University of York in 2008. While that’s not a deal-breaker for me, it perhaps explains why these two other appointments have been made. 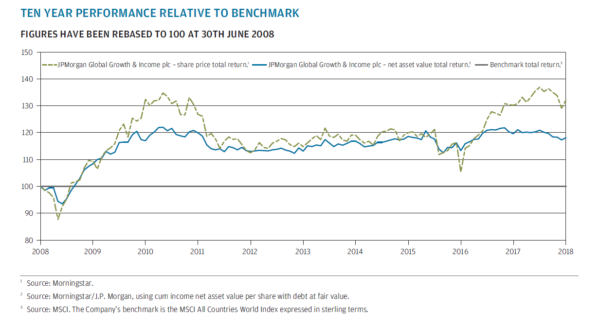 JPGI has managed to outperform its benchmark, the sterling version of the MSCI All Countries World Index, fairly comfortably over the last decade. When you dig into the detail, you can see that a lot of this outperformance dates back to the first few years. 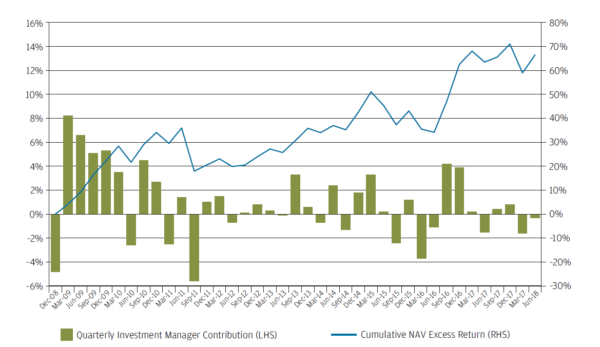 JPGI helpfully provides this chart in its annual report, showing how its fund manager added (or subtracted) value each quarter. At first sight, it’s a little puzzling to see the cumulative excess return continuing to increase. However, this is because it’s measured in absolute terms. As markets have risen over the last decade, the effect of those early gains becomes increasingly magnified over time. It’s easier to see in this chart, where a big lead over the index is opened up in 2008-10, but the relative performance after that has been relatively flat. I have to admit that I missed this detail when first selecting this fund for my portfolio. That was before I started this blog and I tend to research things in a little more detail now. Or at least I like to think I do anyway! Here’s a snapshot of the portfolio from JPGI’s February 2019 factsheet. As usual, you can enlarge the image by clicking on it. It’s mostly a large-cap portfolio, with only 5% of assets in companies valued at less than £10bn. It’s mostly developed world, too, with 85% in the US, Europe and the UK. There are 86 companies in the portfolio right now, near the top end of the usual 50-90 range. The position sizes of 75 out of those 86 fall in the range of 0.5% to 2.0% of assets, so both large and small positions are quite rare. Gearing can range from 5% net cash to 20% of debt but doesn’t seem to vary that much in practice. It typically seems to vary between 5-10% of debt. The basic management fee for JPGI is just 0.4%. However, there is also a 15% performance element if it beats its benchmark. Performance fees whacked up costs in for the years ended 2009, 2010 and 2011, as you might suspect, but they haven’t had much impact since, according to the most recent annual report. Total ongoing charges excluding the performance fee have been around 0.6% a year over the past decade. That seems pretty reasonable for what’s a reasonably small fund with some £400m in assets. The costs in the Key Information Document differ significantly, as they often seem to do. They total 1.57%, which breaks down into 0.38% for transaction costs, 0.8% in ongoing charges and 0.39% in performance fees. Transaction costs seem quite high relative to other funds I have looked at recently, although given its remit this trust probably churns its positions more than most. The performance fee number strikes me as odd given the fund’s recent performance record. Among my global funds, JPGI is my smallest position, so a change of manager isn’t as alarming for me as it might be elsewhere. I don’t see any particular reason to sell out right now, but equally I doubt I will be adding to this position in the next year or two. In the meantine, I’ll be keeping a lot closer eye on the commentary in the next few reports to see if there is any change of tone. It’s possible that we could see some fairly radical changes to the portfolio, depending on how Woodhouse views JPGI’s current positions. I’m assuming he is the main man out of the three co-managers, but I guess we’ll see how things develop. Taking a view on a new manager is never easy, though. It can take a few years for any prowess, or lack of it, to become apparent. Currently seems expensive but performance has been good. I used to hold this when it was JPMorgan Overseas not long after they took over my other Fleming trusts covering the US and Europe. I do like the way JPMorgan offers a good range of IT’s, something which attracts me to them. Yes, JPMorgan does seem to be one of the better big institutions when it comes to investment trusts. I held its emerging markets investment trust for a long time and it’s been run by the same guy for 25 years now I believe.